As the movie began, I couldn't take my eyes off of it. The animation was absolutely stunning and breathtaking. The way the grass moved, the colors of the flowers, the characters themselves....pencil and paper drawing at its finest. The soundtrack was also captivating. There were moments of silence, pure silence. It was so interesting, and different than the animation my daughter (who is 4) is watching. There never seems to be a moment to relax when watching most things today. But this movie.....I was just taken in. My attention was full from the time the movie began until the closing credits. Like I mentioned, the movie is about a family of "borrowers" who live in the walls of a human house. The live off of things they take (borrow) from people and nature. Things that people won't miss if it is gone. 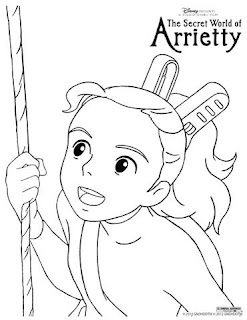 One day, while Arrietty is out on her first borrowing mission with her father, she is seen by "the boy" Shaun. Since borrowers can not be seen by humans, the family is forced to pack up and move. 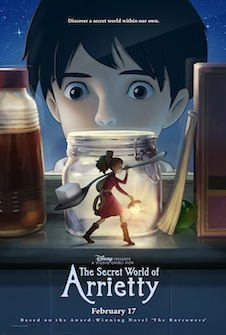 What I particularly enjoyed was the friendship between the two main characters (Arrietty, the borrower, and Shaun, the "human bean") They were an unlikely duo who seemed to need each other. They are both coming of age in different ways, and their bond keeps them strong. Throughout the film, these two come together to change each others' lives forever. The story was *based* on The Borrowers, but is not really a true retelling. As a teacher, this is where the fun begins. 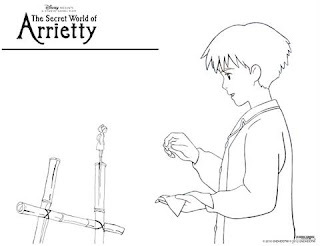 I kept thinking of curricular tie-ins throughout the movie. Here are a few of my ideas. There are many themes present in this film. Friendship, survival, and trust are three that really stood out to me. 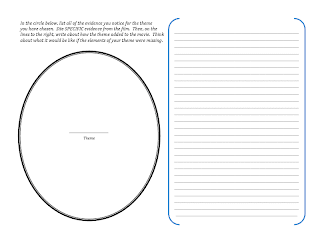 You could have your students jot down all of the evidence they find to support the theme. Then, have them write an opinion piece about how that theme was essential to the story. What if the friendship between the two didn't exist? What if the family didn't hide themselves from anything...would they survive? How does trust play an essential role in the movie? Watch the clip below with your students. Discuss with them how they are also part of a line of people who all are alike. 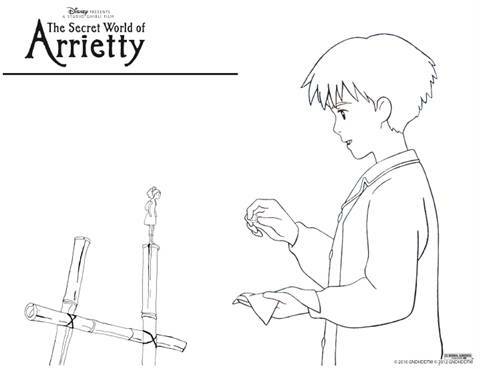 Just as Arrietty is from a long line of borrowers, the students too have family traditions. Have them write about their own family traditions. You can even ask them to write as if they are describing these traditions to someone who has never heard of such a thing, as Shaun has never heard of borrowers. 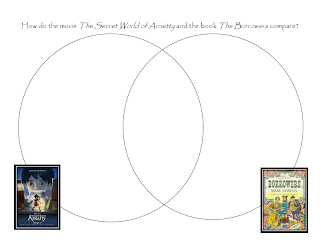 Of course, reading The Borrowers and then creating a compare/contrast essay is a no-brainer. How did the writers of the movie stay true to the book? How did it differ? WHY did it differ? 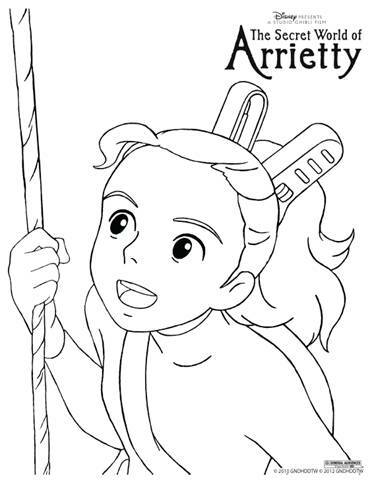 Here are also a couple of coloring pages that Disney released for your class. Thank you for these great ideas. I saw the movie last night and thought what a great way to teach my students about the importance of friendships.